fritillaria, originally uploaded by jahansell. We have shingle paths; havoc on the knees when taking photos! 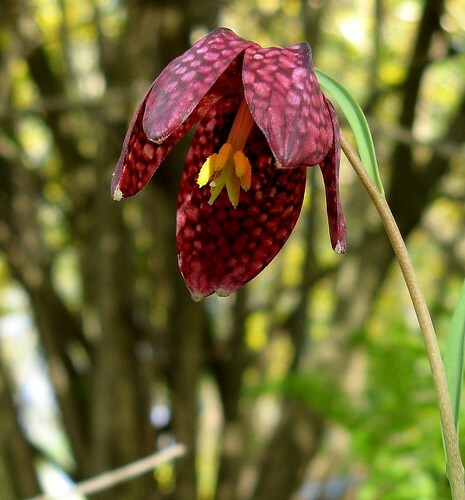 I love the Snakeskin Fritillaria. Were you laying down? I do lay down as I can't bend my knees like I once did. And when I lay down then I have to roll around and figure out what to do to get back up. So I don't get down often. I like your photo and the flower is fabulous. It reminds me of a kind of poison plant. You must have dug a foxhole! A really nice angle. Thanks for all the work to get it. I am still trying to put the picture of missing UK little girl Madeleine's face into the minds of many, so, if your readers would pop over to Cheltenham to have a look i'd be grateful. You never know she could be in your road or mine by now. We can all look! Thanks. wow- this is so fantastic- so small and grand at the same time. thanks for bringing it to my attention! Nice! I think there's a type of butterfly called a fritillary -- they must be related names, somehow.